Are you ready for U2’s hit and run performance at Live8 this Saturday? The band are kicking off the day at London’s Hyde Park, playing ‘St Pepper’s Lonely Hearts Club Band’ with Paul McCartney and then, according to a schedule sent out to affiliate broadcasters, a short set of three songs: ‘Vertigo’ en ‘Beautiful Day’ and ‘One’. (Please note, other schedules state U2 will only do ‘One’.) After their Live8 performance they will jet it over to Vienna to continue their Vertigo Tour on the same day. It’s not as impressive as Phil Collins’ Concorde stunt 20 years ago, but a valiant effort nonetheless. Our London spy had a look in Hyde Park earlier today. Here’s what we would call a pretty unique look at the stage as it’s being prepared for tomorrow. Our correspondent reports an early soundcheck has begun: Annie Lennox is billed first for that. 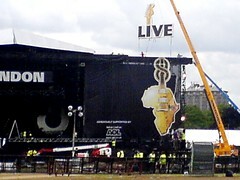 The ‘golden circle’ area is about twice as large as U2’s and the media area looks like a NASA substation. There’s a scrolling screen at stage eye level, featuring drop the debt messages and there’s currently a grand piano on stage. London’s buzzing with activity already. Fans were camping from Tuesday night for Wednesday 3pm, just to get the tickets to watch it on the big screens. Check out the London running order in The Mirror. Hands up who wants Jake ‘Scissors Sisters’ Shears on stage with U2. I heard him say ‘you can march with us in Edinburgh’ or something to that effect. That doesn’t have to mean he’s there himself. Must have been at either London or Glasgow where he literally said he’d be there then… He was quite specific about it, and I’m 100% sure he used the word “I” when talking about joining the march. I thought I heard they were also playing beautiful day. OK — I’m heading down there now. Lucky enough to win tickets. Armed with my trusty 20D, 70-200 f/4 lens and recently acquired 2x teleconverter. Gonna need all that zoom as even with an 18 hour wait, I’m gonna be miles away – especially with that huge ‘snob circle’ up front. A little disappointed that U2 are playing just ‘One’. Really thought that Crumbs would make a debut – but that would be too logical! Sure hope they’ll play more then one song! I bet Larry can’t wait to get in one of those uniforms, lol. Great pictures of the stage, can I use them for a blog in Mexico? Oh I’m up, I’m very up. We got a broadcast schedule at work, it appears U2 are also doing Vertigo and Beautiful day, though it doesn’t say so on any other schedule I’ve seen. Rod, please e-mail us your blog’s URL. I think u can guarantee the Vertigo, BDay and One list. Listening to the BBC broadcast of the Twickenham Vertigo today, it felt spot on. Lift off..BDay fits perfectly. One is One…nuff said. On CNN Bono said, when asked “why live aid again?”, they we’re doing the gig so they could play the right song. I think that means “Pride”. I read somewhere else they’d be playing “City of Blinding lights” a song- which seems to me – to be a love song to Tokyo. Although I’d let the kiddy rockers off with such poor selections, to many music fans – and U2 fans esspecialy – you’ve got to be careful with such loaded songs. What hasn’t One been accosiated with – I have a “one” tea-cup. “one life, one teaspoon”. I kid you not. They should play John Lennon’s “How Do you Sleep at Night?”. For many reasons – its a great song too. Er…Callum? ‘How do you sleep’ is a song John Lennon wrote to let out the anger and hate he felt at that time towards Paul McCartney, after the Beatles just split up. A lyric from the song: “The only thing you did was ‘yesterday’ and since you’ve gone you’re just anoter day’. Speaks for itself a bit doesn’t it? Hardly appropriate for a show where McCartney himself will be performing. Btw, Macca responded to Lennon on his next album with ‘Let me roll it’, a song só very ‘Lennon-esque’in everything, that it is really a parody. The lyrics were a lot less hateful though: “My heart is like a wheel, let me roll it to you”. And that concludes professor Wendy’s lecture on internal Beatles conflicts today, thank you! Just heard the same thing about them wearing the original Sgt. Pepper’s Lonely Heart uniforms. Someone had better get pictures of this! I can’t believe I didn’t spot that. Well, I’m not a big Beatles past and present time but anyway. Johnathon Ross were just interviewing Kene – who said they had just walked across Hyde Park and heard / watched Bono and Maca doing more Sgt. Pepper’s – no uniforms mentioned. I’m booting up the PVR, I’ll see If I cant get some torrent thing going – that’s going to be legal I would imagine, no one can hold rights to an event about ‘getting it out there’. ‘he’s no exactly tall or anything… ‘ Yeah, rub it in, e! Actually, there not very tall in Ireland in general, I noticed last week, when we were there. I felt like a giant with my very Dutch 5ft10.